Saucon Valley freshman, Ty Csencsits, came up big for his Panther brothers. Hershey Park’s Super-Dooper-Looper, across the parking lot from the Hershey Giant Center Arena, currently lies dormant. Maybe it’s a seasonal thing, or just maybe there is enough roller-coaster thrill taking place inside the Giant Center. 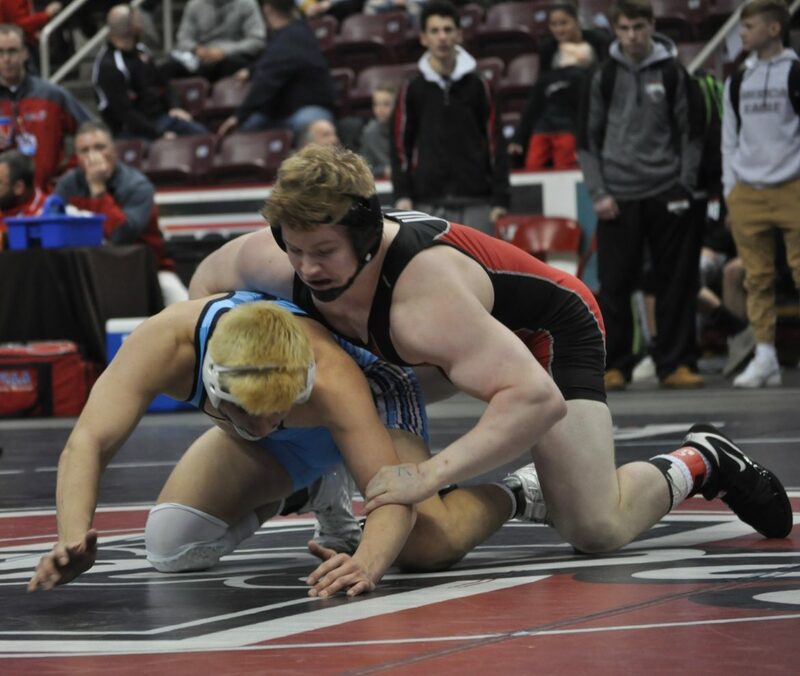 Starting at the 220 pound weight class, Saucon Valley went up with a 9-0 lead to start their quarterfinal match against District VII champs, Burrell Buccaneers. Then, the Panthers found themselves down 19-9 and then again at 22-12. 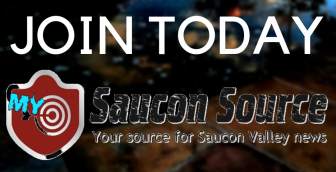 Showing a ton of courage and resiliency, Saucon Valley continued to push forward and win five of the last six bouts to earn a hard-fought 32-25 victory. 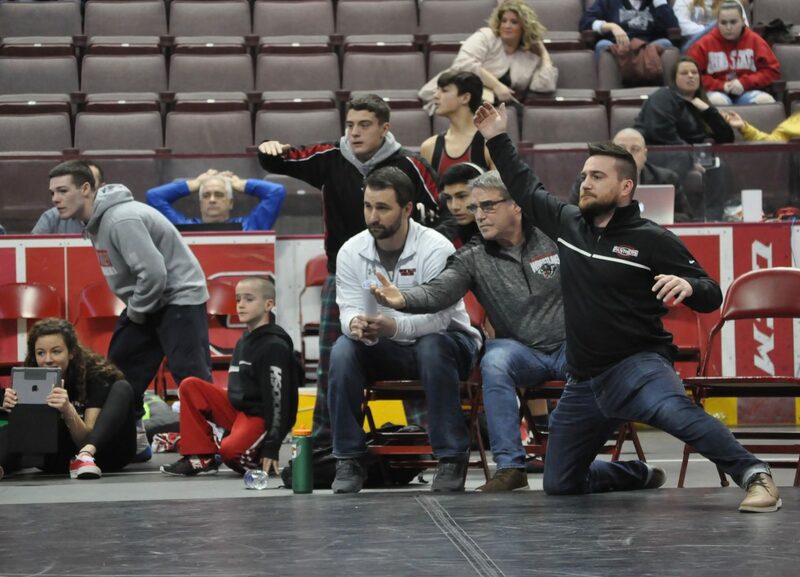 This instant-classic win catapulted the Panthers into the 2019 PIAA state wrestling championship semifinals. Ty Csencsits pushing the pace against the Burrell Buccaneers. 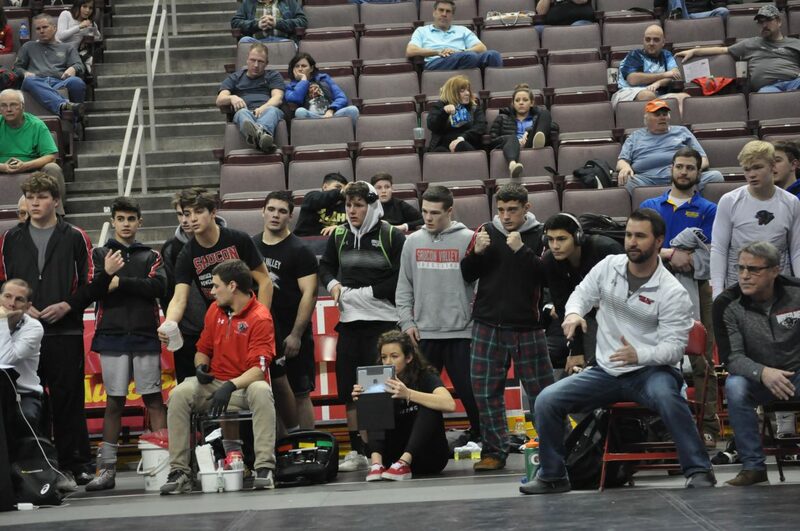 With the sweep of the final three bouts, Saucon did win eight of the 14 weight classes. The Panthers got pins from Ty Csencsits (152) and Nick Warnke (285). 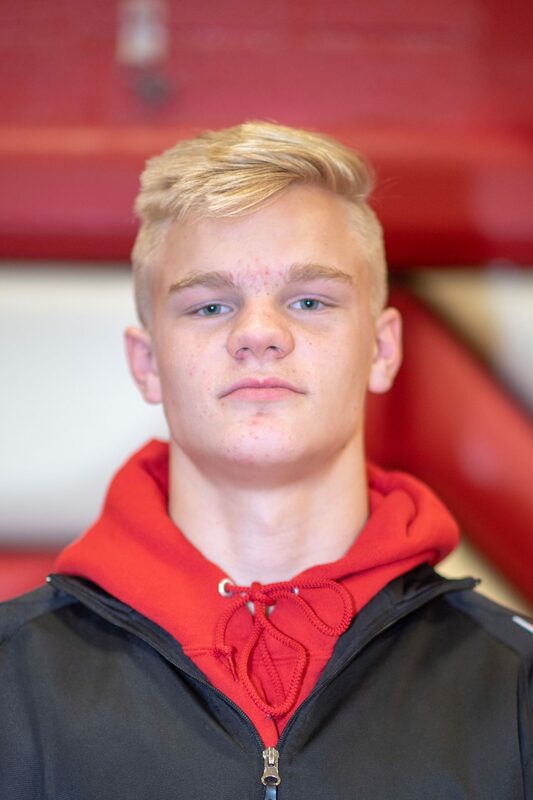 Warnke’s pin was not totally unexpected, but Csencsits, a freshman, had his hands full and trailed Noah Linderman 1-0 about half way through the third period. With his Panther teammates down 22-16 with only four bouts remaining, Csencsits suddenly popped Linderman to his back and pinned him with :52 seconds left to wrestle. Csencsits’ pin knotted the score 22-22 and instantly injected life into Panther Nation. 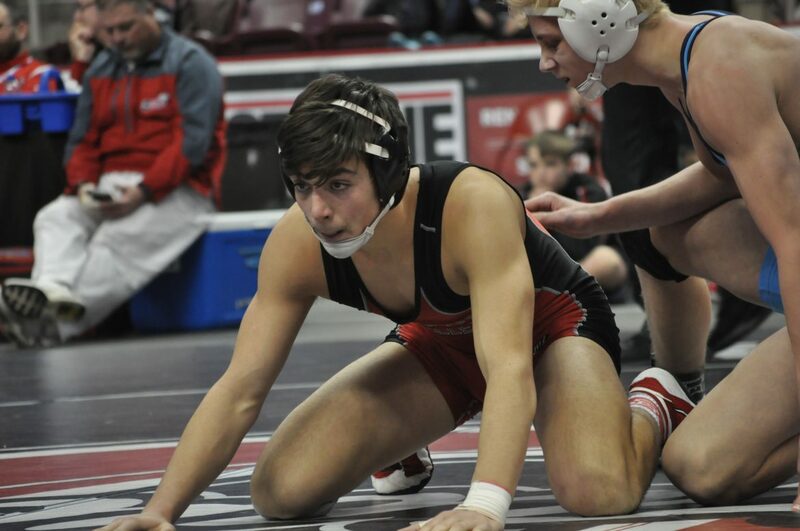 In addition to the pins by Csencsits and Warnke, the Panthers earned a major-decision from Nick Rosengrant (145), and decisions from Josh Jones (132), and Jared Harka (220) to register their twenty-two points. Panther freshman Dante Mahaffey was dialed in for his entire bout. As if Csencsits’ drama at 152 was not enough, fellow freshman Dante Mahaffey (160) spiced things up some more. Trailing 1-0 in a bout where points were extremely rare and precious, Mahaffey suddenly unleashed a “cement-mixer” with only fifteen ticks left on the third period clock. 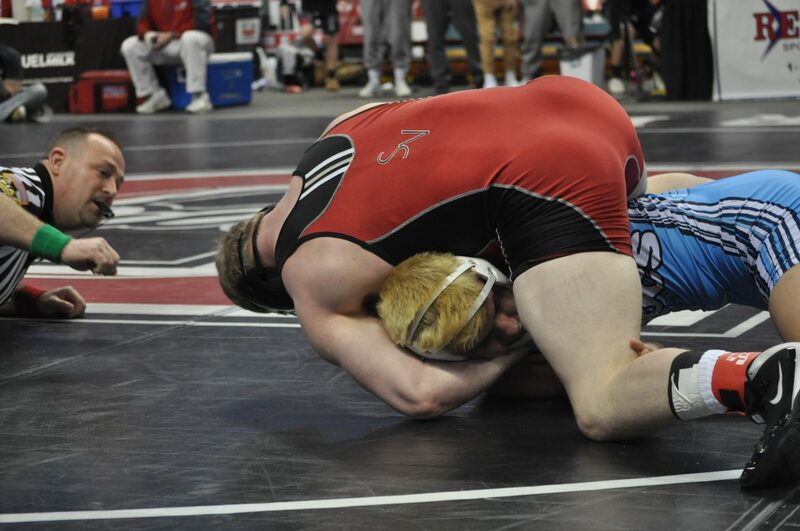 He was unable to stick his opponent on his back, but Mahaffey was nonetheless able to secure a two-point takedown. 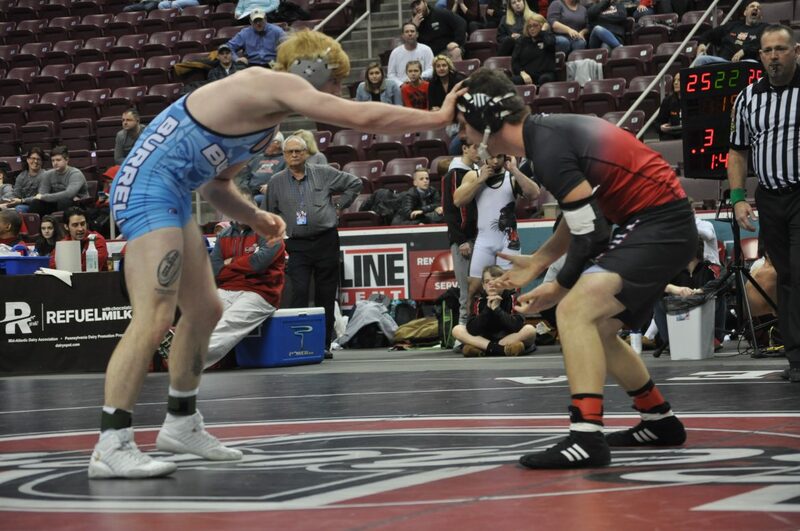 By refusing to give in, Mahaffey snatched inevitable victory from his Burrell opponent to put his teammates up 25-22 with only three bouts remaining. Jarrett Hirschbeck stepped up and did not back down against Austin Mele and the Burrell Buccaneers. 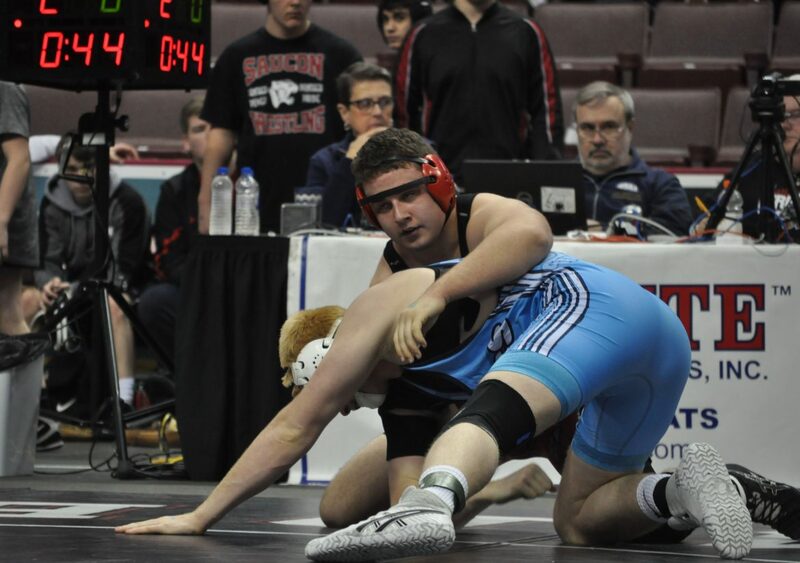 For some unknown reason, the Panthers Matt Arciuolo (26-4) was scratched from his much anticipated matchup with Burrell’s Austin Mele (24-5). 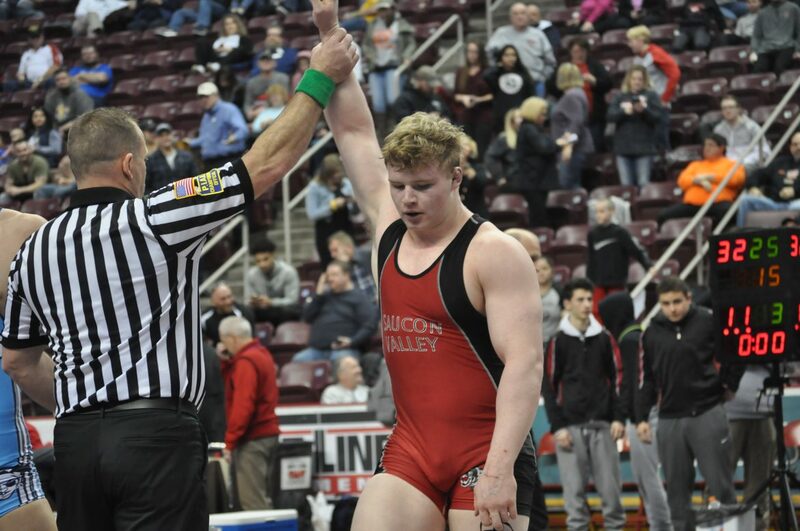 But, Saucon Valley’s Jarrett Hirschbeck (12-8) covered for him. Hirschbeck did not win, but gutted out an amazing performance that minimized Mele’s attempt for bonus points. Hirschbeck held Mele to a 9-6 decision which tied the team score 25-25 with two bouts to go. 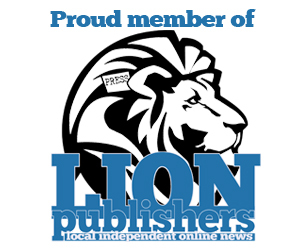 Braydyn Lugardo get his ……..TWwwoooooooo! 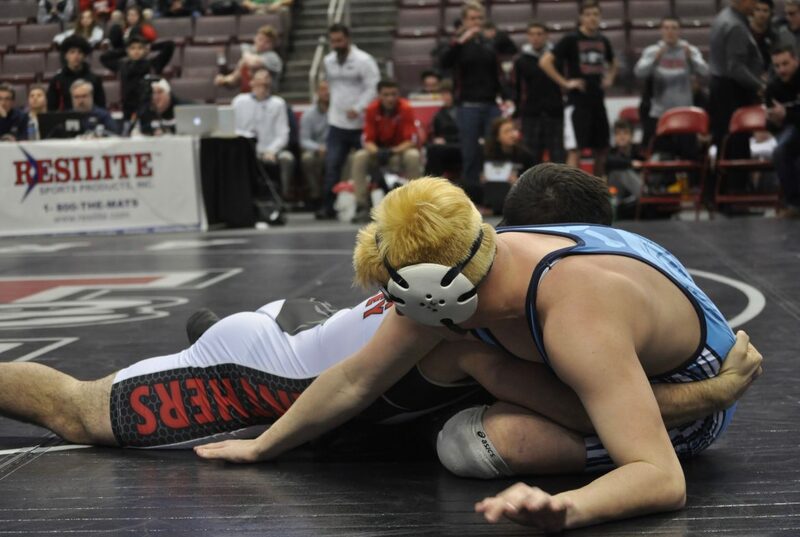 Panther junior Braydyn Lugardo (16-8) took the mat against Burrell’s Dan McCarthy (12-7). Lugardo jumped out to a 4-1 first period lead. Momentum swung a bit in the second period when Lugardo was penalized for an illegal move and then was forced to cut McCarthy loose for an additional escape point that cut Lugardo’s lead to 4-3. Lugardo added a third period escape point to the scoreboard, but the bout was in the balance until the very end. With only one bout remaining the Panthers led 28-25. The Panthers Dane Csencsits gets three near-fall points to help seal the deal. Saucon Valley’s Dane Csencsits (23-5) and Burrell junior Richard Feroce (21-8) squared off in the finale at the 195 pound weight class. Csencsits scored a first period takedown to take a 2-0 lead into the second period. He added a second takedown and three near-fall points to go up 7-0. Feroce, however, was able to reverse Csencsits and the second period ended with Csencsits leading 7-2. With both wrestlers weary and fatigued, Csencsits reached deep within to take Feroce down for a fourth time. 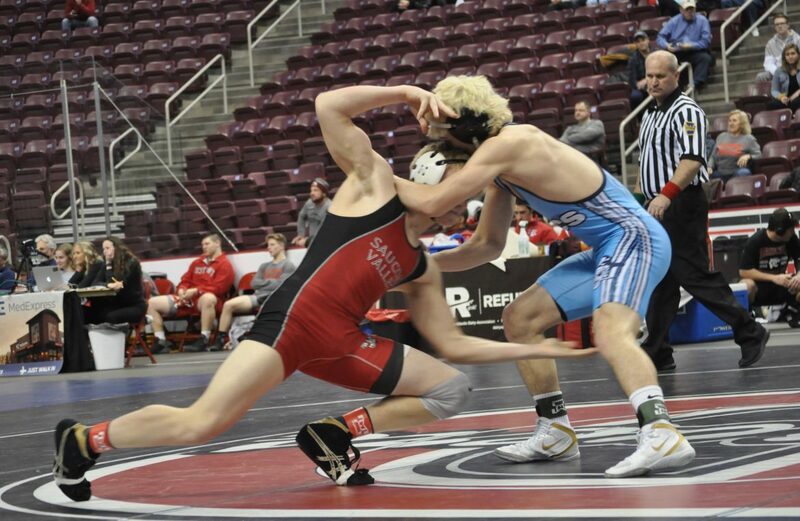 Feroce was able to escape, but Csencsits’ victory assured the Panthers a place in the 2019 PIAA state wrestling championship semifinals! It could be argued that big brother Dane finished a rally little brother Ty started. 106- Aaron Edwards So., Burrell, decision Cael Markle Fr., 7-2. 113- Nicholas Salerno Fr., Burrell, major-decision Connor Nicholas 18-6. 120- Ian Oswalt So., Burrell, pinned Kevin Dyer Jr.
126- Trent Valovchik Jr., Burrell, pinned Ryan Gilbert Fr. 132- Josh Jones Sr., SV, decision Bryan Gaul Sr., 8-5. 138- A.J. Corrado So., Burrell, decision Thomas Spirk Jr., 3-0. 145- Nick Rosengrant Sr., SV, major-decision Simon Slahtovsky So., 12-1. 152- Ty Csencsits Fr., SV, pinned Noah Linderman Jr. (5:08). 160- Dante Mahaffey Fr., SV, decision Dominic Holmes Jr. 2-1. 170- Austin Mele Sr., Burrell, decision Jarrett Hirschbeck Sr. 9-6. 182- Braydyn Lugardo Jr., SV, decision Dan McCarthy Sr. 5-3. 195- Dane Csencsits Jr., SV major-decision Richard Feroce Jr. 11-3. 220- Jared Harka Sr., SV, decision Mason Slahtovsky Sr. 3-0. 285- Nick Warnke Jr., SV, pinned, Jacob Bell Jr., 1:28. 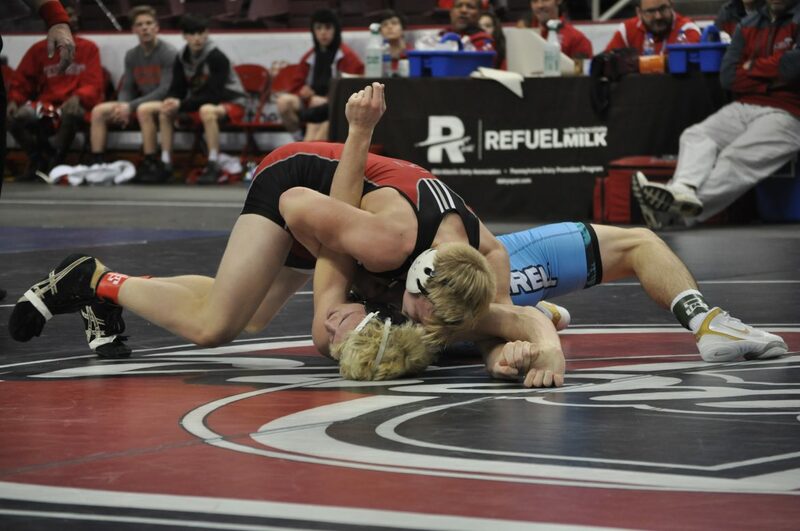 Coach Shirk said it: “Ty never stopped wrestling and came up with a huge pin to propel the team forward”. Up Next: The Panthers advance to the PIAA semifinals for a showdown with the #1 ranked team in the state, Reynolds. The Raiders are the District X champs and were a 54-9 winner in their quarterfinal matchup with Westmont Hilltop. The semis are schedule to start tonight at 8 p.m.